Take a day trip up to the Blackall Range Hinterland near the Sunshine Coast where you’ll find, nestled in a picturesque rainforest valley, the Kondalilla Falls National Park. The falls (named after an Aboriginal word meaning “rushing waters”) drop 90m through dense subtropical rainforest – an area that is home to over 100 different species of birds. The park is a perfect place to have a picnic and there are a couple of bbq areas available. 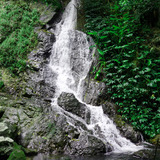 The park has three different walking trails that you can choose from – the longest winds down through the rainforest, past the rock pools to the base of the waterfall. The 4.6km walk takes about 2 hours – but it’s best to leave some time to take a dip in the rock pools on the way down the trail. Remember to wear good walking shoes as the rocks at the base of the falls can get a bit slippery. From Brisbane, the drive to the falls takes roughly 2 hours – travel along the Bruce Highway, then follow the scenic Glass House Mountains Road to the Landsborough turnoff and drive on to Montville. The park located about 4km past Montville and is signposted on the left. If you’re planning to make a day of it I’d recommend spending the morning exploring the local craft shops and galleries in Montville and Flaxton. Stop off at the Penefathings Inn for a great lunch and to take in the mountain-top views. Head on down the road to Kondalilla Falls after lunch with a packed afternoon tea. Stop off at the rock pools for a cooling swim and perch yourself on the lookout with your picnic and enjoy the view over the spectacular Obi Obi Valley. Visiting the falls in the afternoon means that you can avoid the midday heat when you are walking the rather steep route back up from the base of the falls. On your way home don’t forget to pick up some of the home-grown produce from the road-side stalls – the macadamia nuts and avocados can’t be beaten. Did this this weekend. Can't recommend this enough. Great day out, and such a beautiful spot. You'll be guaranteed to come home with many wonderful memories and photographs.